Home > Precious Metals, Silver	> **ALERT*** FAKE Silver Coins/Bars/Ingots ARE on the market in U.S.! **ALERT*** FAKE Silver Coins/Bars/Ingots ARE on the market in U.S.! **ALERT** FAKE Silver Coins/Bars/Ingots ARE on the market in U.S.! I had posted about how Tungsten is up 70% in the last year and inserted a video showing fake gold and a video with David Morgan of Silver-Investor discussing fake gold and silver. Last week during the interview David Morgan did with me, he talked about fake gold and silver possibly being on the market, besides other information about it. He also said in the interview, if there will be any fake silver coins they will fake the old coins and not new ones. WOW – he got that one exactly right! Gold has been a given in regards to possibly being fake due to the price of it! It is well worth an organization (ie: Fed, govt) to fake besides the price, they are pretending there is much more gold than there really is. With silver, the cost of faking it compared to the cost of the metal itself has not made it such a likely candidate as gold is. But times have been changing and in my opinion will be really changing in the not too distant future! In fact this next month – March, there will hopefully be fireworks going off at the Comex. The physical Silver market is tight, all the experts are saying that. So it was simply a matter of time before fake silver began getting on the market. We did not have to wait too long, Fake Silver is now here! There is Fake Silver on the market now! The coins are Morgan Silver Dollars dating all the way back to the 1880’s and are in pawn shops, besides who knows where else! I would assume it is not just the U.S. that has Fake Silver but also other places in the world too. A pawn shop in Washington State got a shipment of Morgan Silver Dollars in and felt something was not right about them. They called in a policeman, who could not tell what was wrong with them, until he was told they were fake. The silver has an iron core and so people WILL be able to tell a Fake Silver coin by using a magnet! If a strong magnet is attracted to the coin it is fake! A real silver coin will not attract a magnet but fake ones will! Also a Fake Silver coin will thud when dropped compared to a high pitched ring of a real one, dropped! PORT ANGELES, Wash. – Counterfeit coins by the thousands are turning up in Washington state, and authorities are warning coin collectors to be on the lookout for them. All or most of the counterfeits appear to be from China. Several of the fake coins were recently sold to a Port Angeles business, EZ Pawn, for $400. They would have been worth more than $1,500 had they been real, Benedict said. Officer Benedict got a call from EZ Pawn. The 20 counterfeit U.S. Morgan silver dollars were supposedly from a century ago. Brian Winters of EZ Pawn has bought coins for years – and even he was fooled. Unlike most counterfeits, the coins did not all have the same dates. One was a super rare 1893S, worth thousands and thousands. It was at that time Brian pulled out a loupe and looked at a real coin and a suspect one. He found the “T” and the “I” too thick. All the coins were fake. The real coin weighed in at 26.7 grams. The fake was two grams lighter. For those of us without a gram scale – there are other tests for detecting the counterfeit coins. The real ones have a high-pitched ring when they’re dropped. The counterfeits land with a thud. Also – a strong magnet will detect small amounts of iron in counterfeit U.S. coins. If a supposedly “silver” coin has even a little bit of attraction to the magnet, then it is a fake, Benedict says. The counterfeits aren’t just limited to silver dollars. Other coins – including Indian head pennies – also have turned out to be fakes. And EZ Pawn says they’re continuing to see fake coins brought in by other customers. And Benedict warns businesses to be suspicious if someone uses only coins to pay for merchandise. “Use caution if someone brings in a lot of coins to buy something, and look them over carefully,” Benedict said. Personally, I would beware of buying any metals on Ebay or any place I can not touch and feel the metals and completely check them out before purchasing them! Buyer Beware! Take precautions, check out listings on Craigslist in your area. Buy from local people and online metal companies who get their coins directly from the mints and guarantee the Silver content! 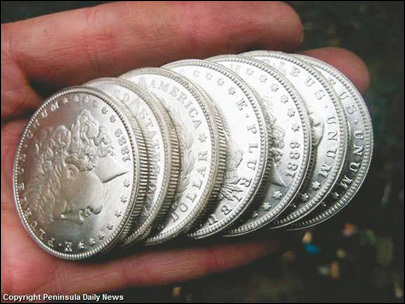 EDIT – I just looked on my local Craigslist and I believe there is an ad there for Morgan Silver dollars that are the fake Morgan Silver Dollars. The coins are in plastic holders and they are very shiny! So, people will be selling them on Craigslist too – but if you consider them – Take them OUT of the holders! If the owner does not want them taken out of the holders so you can check them out more thoroughly – then WALK AWAY! Edit – I just did a short youtube video about it, for those who would rather hear about it then read about it.